Holiday greetings from Andzia’s Amber Jewelry!! 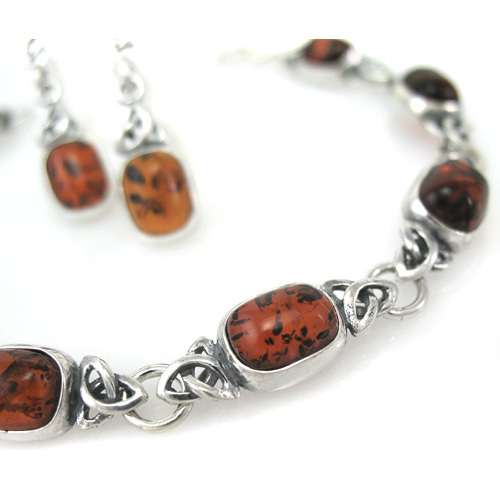 As you know, Baltic amber comes from great ancient forests. Trees, wreaths… greenery & garlands all play a starring role in everyone’s winter festivities. 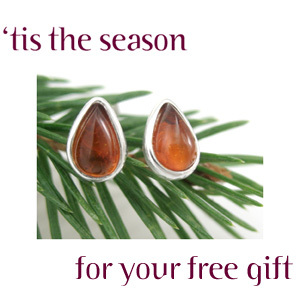 So this year we’ve selected amber & sterling teardrop stud earrings as our holiday gift to you. In rich cognac color, this $22.50 value is yours free with any $50.00 purchase while supplies last. This is the perfect time of year to have a little extra gift tucked away for an unexpected guest or a spontaneous thank you. Or, as a pick me up, bonus gift for yourself- a gift for the giver! For your convenience, we would also like to offer you 10% Off sitewide for the next few day – this offer has expired. Join our newsletter here to be the first to get news & coupon or promo code offers like this. This offer expires at midnight, Monday Dec. 10th. We’ve also made up an attractive new amber care guide, included free with all orders. The front is a copy of our International Amber Association certification attesting to the fact that you’ve selected authentic Baltic amber from a reputable dealer. The back contains basic information about amber as well as easy to follow amber care guidelines. Should you like more than one, please let us know in the comment area at checkout. Of course, giftboxes are always provided as a courtesy. Some of our most popular designs have been restocked just in the nick of time… including Brigid’s Fire celtic amber jewelry set (shown in detail below), Audra amber set, Elga & Wisteria. Stop by to see new amber jewelry arrivals including amber dragonflies & rainbow studs as well as wonderful amber horoscope lockets, heart lockets & our signature stunning handcrafted flower series Marguerite. More selections to arriving throughout the month. We’ve recently added many new one of a kind designs, among them a series of horoscope glyphs, or signs, which contain absolutely zero metal. And a beautiful series called Mythic Fragment. Coming up we’re working on releasing the DK Collection, a designer collection by award-winning amber artist Dorota Kos. Based in Gdansk, Poland, Dorota works with amber & woods like ebony, acacia, black walnut & various fruit woods. Wood is a "warm" material, just like amber, therefore their combination is also warm. Wood and amber is a good match. We need to remember that amber originated from trees many millions years ago. The combination of wood with amber is like the combination of the past (amber, which was created millions year ago) with a presence since a tree was fresh just a while ago. Moreover, the colors of amber and wood – brown, match well. We’re just polishing this interview & plan on releasing both it & the DK Collection next week. So check by amberjewelry.com or keep an eye on your inbox early next week if this collection interests you. The interview will be posted in our Amber Reading Room. Thank you so much for taking a moment to read this brief newsletter. Thanks to so many of you for allowing us to continue doing what we love & being a small part of your holiday season. Andzia’s Amber Jewelry is the only retail firm in North America to have the distinction each year since 2002 to be a firm recommended by the International Amber Association. We are humbled & grateful for the continuing honor.